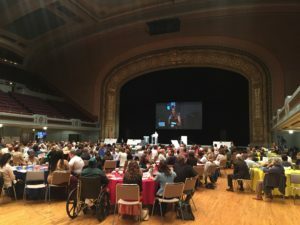 Kristin Hall, Director of the Cleveland Mayor’s Sustainability Office speaks at the 2017 Sustainability Summit. Clevelanders gathered recently for the ninth year in a row to discuss how the city can make itself more sustainable. Mayor Frank Jackson kicked off the event. A great deal of excitement is building towards Sustainable Cleveland 2019 and the work of creating a Thriving City on a Blue Lake. Sustainable Cleveland is a decade-long effort to engage the community in sustainability efforts. The year 2019 will mark the 50th anniversary of the Cuyahoga River fire. Much has changed in Cleveland since the fire, and the fiftieth anniversary will have a lot to celebrate. Many credit the fire with bringing sweeping environmental regulatory change across the nation. This includes the creation of the Environmental Protection Agency and the Clean Water Act, both signed into law by President Nixon. Emmy award winning broadcaster and proud Clevelander Leon Bibb gave a moving tribute to the city. The second day was filled with ideas as more than 500 community members in attendance engaged in an appreciative inquiry process. Focus groups included electric vehicle deployment, local policy, pollinators, watershed improvement, recycling, food systems, and more. Solar deployment was part of many discussions, and last year’s Cuyahoga County Solar co-op was honored.